Providing you the best range of embroidered kurti, embroidery work kurtis, denim kurtis and grown kurtis with effective & timely delivery. We are offering Embroidered Kurti to our client and our product is made of good quality. 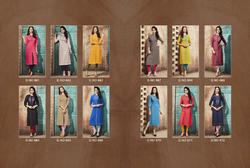 We are offering Latest designer denim kurtis to our client and our product is made of good quality.